I have so many ‘before’ and ‘afters’ to share with you! Here’s the improvement on my Shrimp Tacos. 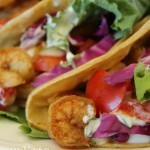 I hope your eyes are telling you how amazing these Shrimp Taco would taste. They’re not lying. This is officially one of my favorite, whip up in 20 minutes dinner. I also just recently discovered Tortilla Land has all natural corn tortillas! Using raw tortillas make a HUGE difference. Don’t believe me? Try their whole wheat raw tortillas on my baked burritos, and you’ll never go back. In small bowl, stir together plain yogurt and cilantro. Cover and refrigerate until ready to use. In a medium size bowl, mix shrimp, chili powder, cumin, and garlic. In large skillet, heat oil over medium heat. Add shrimp to pan. Cook for 2 to 4 minutes ONLY until shrimp are pink. Cooking longer will make shrimp too tough and chewy. Remove from heat. Arrange shrimp down the center of the corn tortilla. Add shredded lettuce or cabbage, tomatoes, and 1 Tb of cilantro mixture. Serve and enjoy! Recipe slightly altered from AHA Healthy Family Meals. Want another quick and healthy dinner? 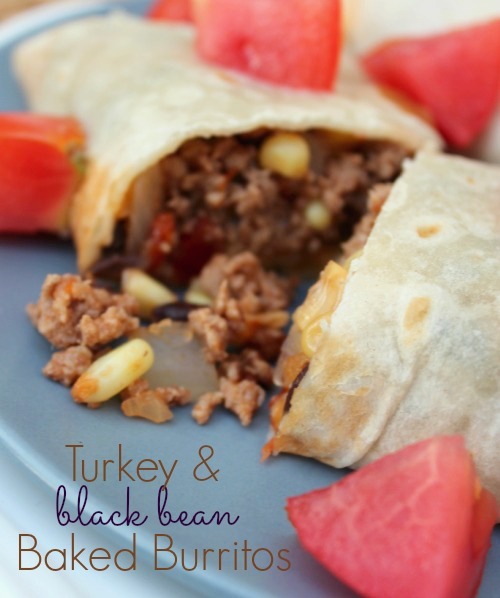 Try my Turkey and Black Bean Baked Burritos. Nice! 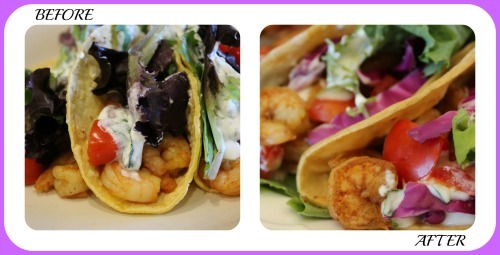 We love shrimp tacos, and yours look delish. Thanks for sharing on It’s FAll Y’all. Thanks, Cheryl! Let me know what you think. We really love these! Love how you show the before and after pictures when you healthify your food! This is great! Love shrimp and tacos. Thanks, Courtney! I’m glad you’re enjoying me sharing my progress with photography. These are really yummy! I LOVE shrimp. Like… LOVE it! I want to make this – looks SUPER yummy!! Ok, these look to-die-for! I was compelled by my taste buds to plaster them all over my social networks – now I’m hungry! Ha ha… Thank you for sharing, Bonnie!